If visiting or moving to Arizona, you should be aware of the state's unique driving laws before you hit the road. Here are the most essential pieces to know. Every state has laws about car seats and booster seats for children. Arizona’s are based not on weight but rather on age and height. Arizona’s child restraint system laws can be confusing, so read up on them beforehand. In Arizona, there is no amount of alcohol that is exempt from driving under the influence (DUI). While you are certain to be fined or incarcerated for blood-alcohol readings of .08% or higher, you can be cited at any level if the officer believes you are impaired. Rental car companies know this, but, if you are moving here or visiting with your own vehicle, you might not know that you can be cited if you have a license plate holder that covers up the name of the state on the plate. A police officer may not stop you for that, but it might be added as an additional offense if you are stopped for any other reason. Roundabouts are becoming popular in Arizona, especially on less traveled streets and in smaller cities and towns. Cities are finding they are cheaper than traffic lights, keep traffic moving, and, if there are fender benders, they tend to be much less serious with drivers traveling at a slower pace. In Sedona alone, we counted eleven roundabouts. Weather plays a role in safe driving no matter where you come from. While we rarely have natural disasters like hurricanes or tornadoes, we do have a weather phenomenon called monsoon. This season, typically in the summer, occasionally brings heavy rain, heavy winds, and dust storms that make visibility impossible. When the rains come, don't drive into those areas that are designated by signage as being dangerous when flooded. It’s for real. Heavy and fast water comes rushing down normally dry washes. Every year some people have to be rescued because they thought they could drive through standing water only to have to be airlifted from the roofs of their vehicles. Plus, Arizona’s Stupid Motorist Law means you could be responsible for the cost of your rescue if you've ignored signs and posted warnings. At this time, Arizona does not have a state-wide law that prohibits drivers from using a phone while driving. It does have a distracted-driving law related to speeding, though, so anything you do – eating, shaving, applying make-up, putting ketchup on a burger, and, yes, texting – can lead to a citation if driving over the speed limit, and Pima County, where Tucson is located, does have a no-texting-while-driving law. Not sure where Pima County starts and ends? An easy fix is to stop texting while driving everywhere. Just about every year in Arizona, a state-wide no-texting-while-driving law comes up as an agenda item, so expect there will be some sort of no-texting or hands-free-phone-only state-wide laws in the future. In the City of Phoenix, it is illegal to send or receive messages using a wireless device while driving. That means that (with certain emergency exceptions) no texting is permitted. This texting ban does not extend to talking on the phone. In Tucson, all non-voice communication (email, texting, IM) is prohibited while driving. In Flagstaff, you can't use a wireless device to send or receive a non-voice message while driving or while riding a bicycle. Drivers in Tempe who are displaying erratic driving behavior of any kind because they are using a mobile device that is not hands-free (talking, texting, emailing, photographing, etc.) will be cited. Since there is no state-wide ban on driving-while-texting or on using the phone, the cities that have decided to take matters into their own hands are those with larger universities, and, therefore, a larger percentage of their populations using wireless devices. Because it is sometimes tough to tell when you have crossed over city limits in the Valley of the Sun, we recommend adhering to the no-texting / no-using-the-phone-or-tablet rule everywhere. Soon more cities or even the State of Arizona in its entirety is likely adopt such laws. Arizona does not have a law requiring motorcyclists to wear helmets. Arizona doesn't have highway tolls. There are no monthly highway passes, tickets to punch, confusing highway lanes, or extra charges from rental car companies for using toll roads since there are no toll roads. That’s not to say the issue doesn’t come up nearly every year. After all, maintaining roads and highways is expensive, and budgets are always tight. However, right now, there are no such tolls. There is a Move Over Law in Arizona. That means, if you see emergency vehicles on the side of the road, you must give them ample space by moving over one lane if it is not dangerous to do so. Let’s talk speed limits. The standard speed limit on main interstates in Arizona is usually either 55mph or 65mph as the roads pass through major cities and 75mph between major cities. Of course, there are exceptions. On a highway that does not have work zones or other special lower speed limits posted, an unwritten rule is that if going no more than nine miles over the speed limit (and not driving erratically) you probably won’t be stopped. However, in December 2016, the Arizona Department of Transportation began designating Safety Corridors. These are segments of both urban and rural highways where serious traffic accidents seem more likely to occur. In a Safety Corridor, enforcement will be aggressive, and drivers may be ticketed for speeding and any other violations with zero tolerance, even if going only one mile over the speed limit. 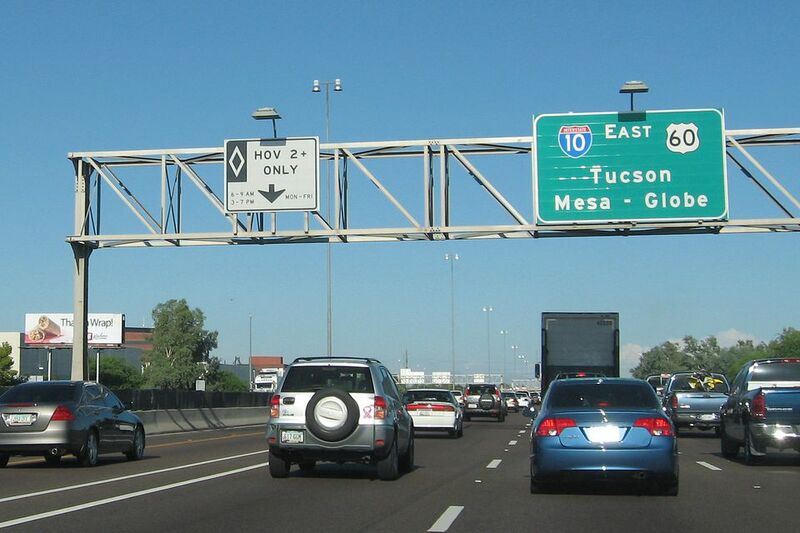 You will find these Safety Corridors on I-10, I-40, and US60. More may be added. Signage indicates where the zero tolerance areas begin and end. Certainly, if you are stopped for some other reason outside of a Safety Corridor, the officer might tack on a speeding violation, even if you're driving less than ten miles over the speed limit. There is one aspect to driving in Arizona that can be confusing relative to I-10, an interstate highway that generally runs east/west, across the country. However, in Central Arizona, between Phoenix and Tucson, the I-10 is a north/south road. That means that you will see highway signs directing you to I-10 East or I-10 West, even though you are driving north or south. So, if you are driving south from Phoenix to Tucson, you will take I-10 East. If you are driving north from Chandler to Phoenix, you will take I-10 West. The Interstate eventually does travel west again outside Downtown Phoenix as it moves on to Western Arizona communities and California. Our major highways have HOV lanes. The HOV acronym stands for "high occupancy vehicle." "High occupancy" in Arizona means two or more living human beings. There are certain hours when anyone can drive in those lanes and other hours when they are restricted. The fine is steep if you are stopped for driving in an HOV lane when you shouldn’t. Additionally, the lines on the highways as they relate to the HOV lanes can be confusing. It is a rule of thumb everywhere else that you are not supposed to change lanes over a solid white lane, but the HOV lane in Arizona is an exception. You may enter or leave the lane at any time; ignore the solid line. In fact, according to ADOT, the double solid white lines also mean nothing. They are just spacers with no associated additional regulations. HOV lanes do have exits; however, you are not permitted to use an HOV exit unless you are legally entitled to use the HOV lanes. Finally, if your car is a hybrid or other special vehicle, you still can’t use the HOV lane without another person riding with you unless you have a special environmental plate or placard from Arizona MVD. The 202 Loop is called the Red Mountain Freeway in Phoenix and the Santan Freeway in the East Valley. It is actually not a complete loop; it's just three sides of an oval. When you are driving on a north/south highway like I-10 or SR101, you will cross over the Loop 202 twice, once over the northern part of the oval (Red Mountain) and once over the southern part of the oval (Santan). If someone tells you to “exit at the 202” make sure you know which 202 to take! There is no leeway on speed limits in a school zone. You can be cited if you go even one mile per hour over the limit. If confused about school-zone signs that read “35 MPH When School Is in Session," take heart in knowing many of these are being replaced with signs that have flashing yellow lights when school is in session. There are two major cautions about driving in Downtown Phoenix. One relates to the METRO Light Rail. Someone who is not familiar with the streets of Downtown Phoenix can be easily confused, not only by the one-way streets and street restrictions but also by trying to avoid turning into the tracks. Even people who know Downtown Phoenix can spend an extra few seconds trying to interpret the traffic signs with multiple arrows. If you don’t have to drive into Downtown Phoenix, try actually riding the METRO Light Rail instead. As in any city, rush hour in Phoenix is no treat, but there is an added feature of which you should be aware if you are driving north or south on 7th Avenue (McDowell Road to Northern Avenue) or on 7th Street (McDowell Road to Dunlap Avenue): they are reversible lanes. Not-so-fondly referred to as “suicide lanes,” the intention is to use the center turning lane for southbound traffic during the morning commute and for northbound traffic during the evening commute. Since you can’t make left turns at major intersection during these designated times, traffic in these lanes often slows for people turning left onto residential streets, or for people who just forgot, didn’t check the time, or don’t know they can’t make turns coming from the non-rush-hour side. Our advice is to stay out of not only the suicide lane but also the left lane to avoid cars swerving into it from the suicide lane. You might think you know the speed limit in an area you drive often. Think again. Some communities are considering implementing variable speed limits to better control traffic flows. Scottsdale has indicated they will try it. Beware! They like to give out tickets in Scottsdale. The City of Tempe has a law that prohibits anyone from smoking in a vehicle with a person under 18 years of age in the vehicle. While they say they won’t stop you just for that, if you get stopped for some other reason they may cite you under the ‘no smoking around kids’ rule. Be aware that most of our cities and towns in the metro Phoenix area are adjacent, with little notice of when you're leaving one and entering another. It may just be safer to not smoke with the kids in the car at all in Arizona.